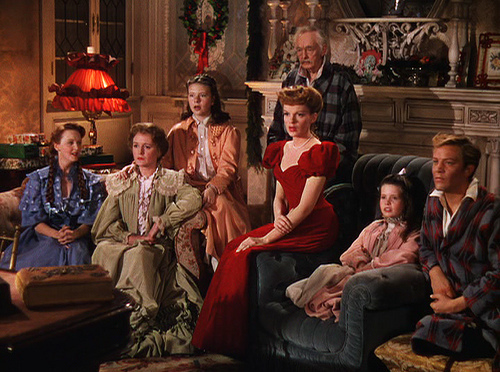 Meet Me in St. Louis came highly recommended due to its place as a musical classic, and because it’s got the downright angelic Margaret O’Brien who I praised heavily in my Christmas review of Little Women. So, as I tend to do with blogathons, I used my contribution to cross a recommendation off my list. I won’t sugarcoat it: I have A LOT of crow to eat….read on. In the year 1904, the year of the St. Louis World’s Fair, the Smith family get lessons in life and love. The plot of Meet Me in St. Louis is a lot to unpack, and yet it’s all wrapped around one prime location for the two-hour runtime, so apologies for the brief plot synopsis. It’s a well-acknowledged fact that I don’t care for the work of Vincente Minnelli. Generally, I find his visuals and slavish devotion to abrupt song and dance numbers makes for an overrated experience; story comes third to songs/dances and visuals. However, I absolutely fell in love with Meet Me in St. Louis! I won’t say I love Minnelli (it’ll take a few more movies), but I laughed and cried like a baby. His nostalgic reverence for the turn-of-the-century is lovingly depicted in this sentimental drama with an emotional punch you don’t see coming (at least I didn’t see it). Since the plot, based on a series of books by Sally Benson spans several months there’s no time to superfluity, of which I find Minnelli is the master of. At a little under two hours, time flies by. Some brief history to emphasize why Meet Me in St. Louis is the seminal movie musical it is: It ushered in the golden era of movie musicals under producer-lyricist Arthur Freed. It ended up being the second most successful film for MGM behind Gone With the Wind. This was Minnelli’s third film, which I also believe is to his advantage as he couldn’t get wrapped up in finding a consistent style or series of tropes (again, something I find to be in all his subsequent works). This also marked a turning point for Judy Garland’s career, being her first major success post-Wizard of Oz (she was playing 17 at the age of 22). Meet Me in St. Louis is commonly considered a Christmas movie, and while there is a Christmas segment I probably wouldn’t add this to my Christmas movie list (although I’m running it as part of my Christmas series). The connection comes from the romanticized version of living the movie presents. Released in 1944, the movie provided hope and a return to normality for many at the time. The passing of the seasons are represented by filigree tintype cards that are lovely and present a sentimental look at the world we yearn to return to. From there, the plot follows the Smith family and becomes an ensemble piece. As a whole, the story comprises the basic progression of not only the Smith’s, but technology and the formulation of a city; a key piece of the movie is the St. Louis World’s fair, and the invention of the telephone. The world is presented through rose-colored glasses and it makes for a lovely adventure. The principle twist involves the family moving to New York. Its significance wouldn’t have been lost on 1940s viewers; the move from a large, urban, metropolitan area, the loss of innocence, the end of an era, and the loss of an uncomplicated way of life. The acting is excellent, and each member of the family truly feel like they’ve known each other forever. I didn’t see actors, but a family experiencing life’s trials and tribulations – much of which is in Benson’s original novels. Judy Garland is the star of the group, playing Esther Smith, and she’s riddled with complexity. She’s introduced acting snobby, warning her older sister Rose (Lucille Bremer) that she needs to get married soon because she “isn’t getting any younger.” While Esther worries about her sister, she yearns to find love herself, specifically with the boy-next door, John Truett (Tom Drake). Garland’s the mistress of the starry-eyed expression and when she’s pouring her heart out, searching for magic in love, you believe it just like you did when she wanted to go over the rainbow. Her first song, about the eponymous boy, is an ode for neglected girls everywhere and the emotions are heightened by close-ups showing the secret feelings she can’t express. (Minnelli employs the camera to convey emotion, which he loses in subsequent films when it’s about dance sequences.) Garland’s voice is beautiful, obviously, and pervades your soul. Her rendition of “Have Yourself a Merry Little Christmas” puts me in tears, and with the added visual of her singing and baby Margaret O’Brien sobbing, I was a mess! Rose and Esther’s love stories aren’t ham-fisted or cloying, but swirled into the drama of the rest of the group. When Rose says there’s more to life than boys, you don’t believe her, but the movie never hammers home the fact that Rose is running on borrowed time. Lucille Bremer plays Rose as a flighty girl who doesn’t realize she is. In fact, her long-distance relationship with Warren Sheffield (Robert Sully) emphasizes the technological advances of the telephone and hilariously shows how unreliable it was for romance. Being the eldest, she’s also the one to dispense advice to the others, such as telling Esther men “don’t want the bloom rubbed off.” While the audience is aware a woman’s virginity is highly prized, I was surprised the script doesn’t hammer that home next to Rose’s age; talk about progress! If Garland hadn’t already roped me in, I was utterly transfixed by the precocious Margaret O’Brien. I adored her as Beth in Little Women, but that was nothing compared to her as Tootie Smith. For one, she’s looks like a little angel dropped down from Heaven, cute enough to eat with a spoon! Also, she witnesses all the events and experiences with fresh eyes, similar to the audience. A child growing up in that era has a wholly different perspective of events than an adult, and that comes through excellently. I loved the character traits she’s given, including a macabre sense of humor and a love of death. She’s also a smartass, telling Rose Warren hasn’t called because “he found another girl.” She’s the type of five-year-old I wanted to be, or at least have as a best friend. The two best scenes she’s given are at Halloween and Christmas. The former has her going to perform a prank on a neighbor she doesn’t like – the neighbors are all aware of the pranks and simply ask the children to return whatever they “steal” – and the camera mimics her POV, tracking her at the same height. As she gets to the door, the look of fear on her face gets bigger (and hilariously adorable) as she approaches the house, lit from below to increase the terror. When she finally gets to the door and throws the flour on the neighbor, running away screaming, she’s relieved and happy to be declared “the bravest of them all!” Every experience Tootie is given mimics the universal reality of childhood itself. The second scene returns us to that Christmas sequence with Garland singing. If Garland’s song doesn’t make you bawl, the innocent face of O’Brien weeping will melt your heart (or prove you never had one to begin with). Frustrated and feeling small, Tootie runs outside and decapitates her snowman family, blending and perverting her love of death. It’s a powerful sequence, watching this small girl act out her rage, another moment of a character having to hide their true feelings, and it’s traumatizing watching this little girl be in such pain. It’s a comfort watching Esther care for the little girl, and shows how heart-felt their sisterly bond is. Of course, with all the excellent characters (including the aforementioned Mary Astor, Marjorie Main, Harry Davenport, and Leon Ames), I almost forgot the songs. Other than the Christmas tune, I enjoyed “The Trolley Song,” if only because it’s indelibly linked with Garland. I feared that after the first song, which had characters spontaneously singing and dancing, musical sequences would spring from nothing, but everything is organic and natural. Meet Me in St. Louis is a perfect movie, and the first first-time viewing of 2013 to garner a five-star review! I implore everyone to watch this and buy it. I was fortunate to see this on Blu-Ray and it’s one of the best transfers I’ve witnessed. The colors are rich and vibrant and it goes along with this jolly movie! So pleased to hear that you enjoyed this movie! I was wondering what you would think of it. Thanks for participating in our blogathon! Thanks for giving me a new movie to add to my growing movie shelf lol. Being a die-hard Garland fan, I’m delighted that you enjoyed this movie. It may be her technical best (“Oz” aside–that one is in a category all its own), and Judy said later that “Meet Me In St. Louis” was the only time she ever felt beautiful on film. I have some recommendations for you to develop your appreciation for Vincente Minnelli. He was an incredibly versatile director and not everything by a long shot is fluff and song and dance numbers. Give “Cabin in the Sky” a viewing–it’s a beautiful all-black version of Faust starring Lena Horne and Ethel Waters. There are musical numbers, but they’re interwoven with the story and are gracefully eased into. Another one to try is “Madame Bovary”–not a musical and the cinematography is the thing to watch for. That and the costumes. Excellent film. And “The Clock,” Judy Garland’s only film in which she doesn’t sing. It takes place in a 48-hour time period and tells the story of a girl who falls in love with a soldier on a 48-hour leave. It might be my favorite Garland movie in terms of plot, and Minnelli directs it with great skill. Give those a try–and I’d love to hear what you think! Let me know! I’ve added all of those to my recommendation list. I did like the original Father of the Bride, which I know Minnelli did, and I think he’s at his best when he’s not consumed with creating innovative dance sequences. Thanks for the recommends! Yes, Father of the Bride is another great Minnelli. He could really do everything, it’s just that his employment by MGM sort of pigeonholed him into musicals a lot of the time. Thank you for educating this critic, whom, as so many others do not know how to “look a little longer” (van gogh’s quote in Lust for Life from Minnelli) and are unable to find “100 or more hidden things” (quoe from Minnelli in The Men Who made the Movies) in the geniality of all Minnelli films. Every time I see critics like the one of this author, I smile and remember how common they are and how they become critics having no perspective of talent whatsoever. Minnelli is controversy, because he brought art, style and entertainment to masses but at the same time he is like caviar: not for everybody. Minnelli’s vision is so above of average intelligence and so ahead of his time that critics in their eagerness to be original, fall into the pitch of the least gifted. However, they limit themselves and obviously miss the minnellian point! Sorry for them, but priviledged to be his daughter and happy I can enjoy, as well as you have, any of his movies discovering his depth and knowledge, not only in film making but also in human psychology. Well, at least this person liked Meet me in Saint Louis, like everybody else I know. .
Hi Tina! First, let me say I’m honored you even gave my site a look. Since that original Meet Me in St. Louis review, I’ve done a complete 360 on Minnelli. If you haven’t read it already on my site, I reviewed The Clock a few years ago and consider it on my favorites of his. I’ve already done reviews for other sites on Father of the Bride and Father’s Little Dividend with a far more nuanced opinion than I once had. The “journey” of my site does allow for me to woefully wrong as I end up discovering new titles, and I did judge him harshly because I started out with the wrong films – that’s my view at least. I hope, if you decide to give other reviews I’ve written a look, that you’ll realize I’m a true movie fan and still learning, haha. I’d love to talk to you further if you’re interested and thank you, once again, for reading, it’s very humbling! Oops, I realized that I wrote “only film in which she doesn’t sing”–I meant only MGM film. She also doesn’t sing in Judgment at Nuremberg or A Child is Waiting, but those were much later 🙂 Just thought I’d specify. I do hope to watch Judgement at Nuremberg soon, I have that waiting in my growing pile of things to watch! Your review is spot-on — there really is a magic to this movie and the authenticity of the family unit has a lot to do with it. The great score helps a lot as well. Nicely done. Thanks for reading! Your words are spot on. Thanks for the review! I really enjoyed your breakdown of the film’s elements. Great job! Kristen, for a while there, I wasn’t able to leave you a comment on your wonderful post for MEET ME IN ST. LOUIS, but I’m so glad you were able to tweak the settings — Hooray! I’m usually more into suspense, film noirl, screwball comedy, or some combination of these genres. But it took Mary Astor and your moving, heartfelt post to get my easily-distracted self moved and teary-eyed! 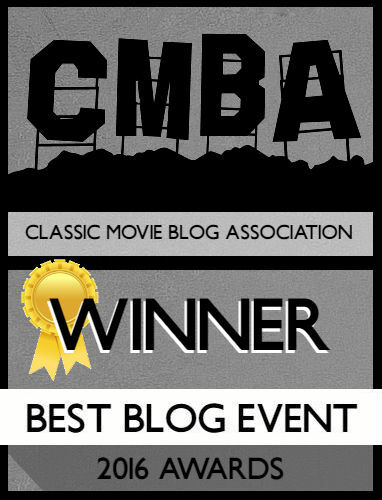 BRAVA to you on a superb post, and thanks so much for being part of our Mary Astor Blogathon. 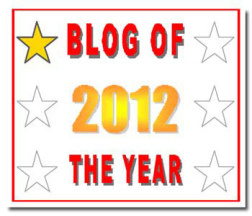 Indeed, you may recall that you were actually the first blogger to sign up for our Blogathon, starting it off right! 🙂 Thanks again! I probably will integrate this into my Christmas collection, who am I kidding? Yes, I’ve seen a few Minnelli movies and find him vastly overrated, then again I did really enjoy this film so maybe I’ve been watching the wrong movies? What movies have you seen of Minnelli’s? I’ve seen The Band Wagon, An American in Paris (which I reviewed on the site) and Father of the Bride. Thanks for reviewing this movie. Having lived in the St. Louis metro area for 20 years and one who actually read Benson’s book on which the movie was made, it holds a special place in my heart. Alas, Benson’s home no longer is standing, but Skinker Blvd. (mentioned as a lyric in The Trolley Song) is still a busy thoroughfare in the Lou. One other thing, in the St. Louis area at Halloween, the trick or treaters are supposed to tell a joke before they get their treat. I have never heard of any other part of the country or MIssouri for that matter requiring that and I like to think that it evolved from the pranks depicted in the movie, and in Benson’s book. Aw, thanks so much for your perspective. I’ve never been to St. Louis but Minnelli makes it look like a glittering jewel. Sad that a piece of history like Benson’s house is no longer around, but I’d love to get my hands on the book someday. Oh, if only we made kids work hard for Halloween candy today! Thanks so much for reading. I would like to watch this movie so bad now! Btw, great Veronika Lake rating system.